Charles Messina is an American playwright, screenwriter, and director. Born in Greenwich Village, of Italian-American descent, he attended Xavier High School and then later, New York University. 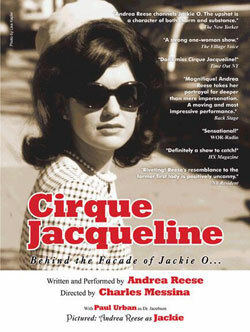 Known for his deconstructive take on biographical subjects, Messina’s most notable stage work as director includes the critically acclaimed Off-Broadway plays “Cirque Jacqueline,” about the life of Jackie Kennedy Onassis, and “Mercury: The Afterlife and Times of a Rock God,” a monodrama written by Messina about Queen’s frontman Freddie Mercury. 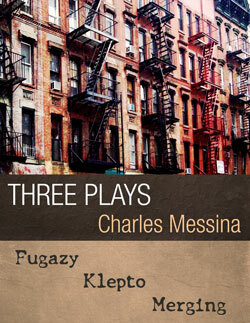 Also in 2007, Messina’s play Merging won BEST PLAY in The Players’ Theater’s Shortened Attention Span Theater Festival in Greenwich Village. 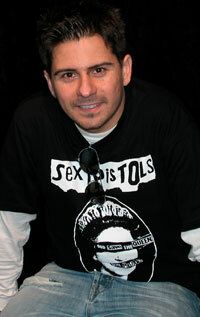 Messina also directed the film version of Merging, which was released in 2009. Messina’s play, “Homeland,” which premiered in 2008, starred Sopranos actors Dan Grimaldi, Jason Cerbone, Joe Lisi, as well as Gina Ferranti and Amir Darvish. Messina’s play “A Room of My Own,” about an Italian-American family living in Greenwich Village in the late 1970s was performed in 2009. 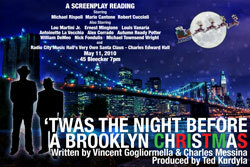 In May 2010, Messina directed and co-wrote (along with Vincent Gogliormella) the script “’Twas The Night Before a Brooklyn Christmas,” starring Mario Cantone, Michael Rispoli and Robert Cuccioli. 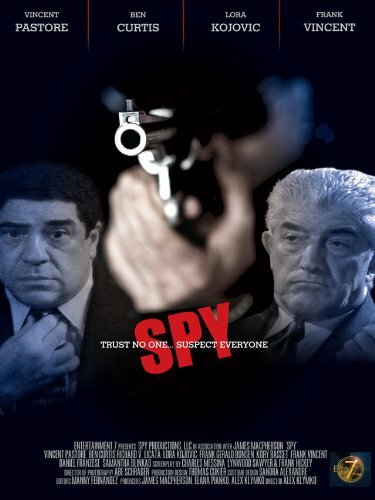 Messina has directed the off-Broadway shows “Rockaway Boulevard” by Richard Vetere, “The Accidental Pervert” by Andrew Goffman, and Art Metrano’s “Accidental Comedy,” as well as a staged reading of his own script “Younger,” starring Joe Piscopo. 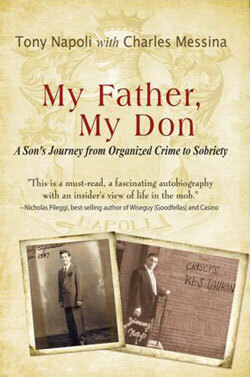 Messina wrote the book “My Father, My Don,” about the life of Genovese Capo James “Jimmy Nap” Napoli and his son Tony Napoli, in collaboration with Tony Napoli. Tiziano Thomas Dossena: You wrote and directed many plays. 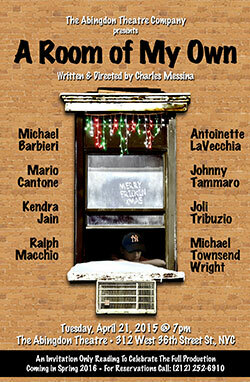 One of them, “A Room of My Own,” is autobiographical and it depicts the story of a young man growing up in an Italian American family in a studio apartment in Greenwich Village. Could you tell us more about the play and the characters? Is the rumor that it may soon become a TV series true? Charles Messina: “A Room of My Own” is a very special project to me. It is my baby. Deeply personal and extremely detailed and accurate in its portrayal of my family and my upbringing. It was a unique family and situation to be raised in, to say the least. Crazy, funny, energetic, it was constant motion in that small apartment. Growing up in Greenwich Village at that time was such an experience. You had the art scene, the gay world exploding, the jazz scene. And here we were this little Italian enclave, this tribe, that had settled there around the turn of the century, holding on to its old ways, as the outside world moved in. There were many influences on me growing up there. But in our house it was so much about survival. My parents were working class people just trying to stay afloat financially. And sometimes in those situations, the best way to get through it is by having a sense of humor. There were a lot of laughs in that place, and in this play, too. 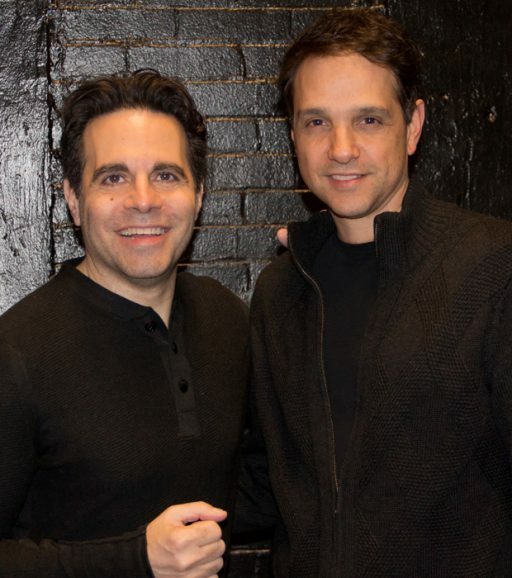 But in the show there is also a deep sense of melancholy as the main character, essentially the adult me, played by The Karate Kid himself Ralph Macchio, looks back on his life and as a writer, tries to change the things he didn’t like about it. Only to realize, through his young self, that you cannot change the past. Acceptance is healing. Such a wonderful cast. I must acknowledge their brilliance. Mario Cantone, Joli Tribuzio, Johnny Tammaro, Nico Bustamante, Kendra Jain, and Liza Vann. I bow to them. They brought my childhood back to life so vividly and accurately. We had a wonderful sold out, limited run-off Bway and have been developing it for television since, it’s true. We are talking to a major network and are very hopeful that the Morelli family will be coming to the small screen very soon. Tiziano Thomas Dossena: In writing your plays, are you always inspired by true events or people you met or are some of them a complete work of fiction? Charles Messina: Well, there’s true and there’s truth and those two things aren’t always exactly the same. But I like stories that are based on real people. The key word being real. If something is real, you just know it, it cannot be denied. We know real when we see it. The way real people talk and walk and behave. That fascinates me. I love behavior. Capturing the specifics of behavior or speech patterns and rhythms, those things excite me. When I was a kid, and still now, I will watch something and I have this internal barometer that tells me, “Hmmm, that doesn’t seem real, that doesn’t feel right.” So that’s very important to me. I enjoy true stories and finding the truth in them and depicting that truth in a way that feels specific and real to me. I think audiences are smart and can sense when something is false. It’s vague. It’s general. It’s disconnected. Real is specific. Tiziano Thomas Dossena: Your play “Merging” won the Best Play Award at the Players’ Theater’s Shortened Attention Span Theater Festival. What is this play about? Is the film version an accurate interpretation of the theatrical one? 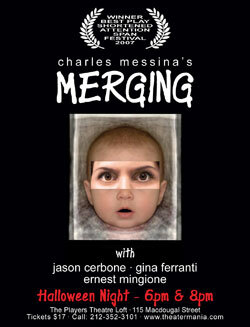 Charles Messina: Merging is a very strange and scary piece about loss and consumption. About loving something so much that you want to consume it thoroughly for fear of losing it. I had never written anything with a horror theme, so I wanted to give it a try. Although I’m not sure it truly is horror, but it’s definitely a psychological thriller. It examines the lives of a couple whose infant has suddenly and inexplicably gone missing and how things in their life begin to unravel quickly and horribly from there. It’s tense. It has a shock ending. But for me, it was really about this theme of loss. Humans do not handle loss, abandonment or separation very well and I wanted to explore those issues with Merging. Audiences seemed to like and respond to it very well. The film is certainly well done and closely reflects the play, practically word for word. Tiziano Thomas Dossena: You also wrote numerous movies’ screenplays. In your experience, how different is the process of writing them from the one of writing theatrical plays? Which one do you feel more rewarding? Are your screenplays original or are they based on pre-existing stories, novels or plays? Charles Messina: There are several differences between writing for screen and writing for stage. One of the most basic is setting. Plays tend to take place in one or two locations. Films can and often do have many varied locations, interior and exterior. So that usually means discerning which stories will work best in which medium. Also, there’s a difference in scene length. That’s a big one. In a stage play it’s all dialogue driven, so you can have a scene between characters that goes on for 10, 15, 20 pages if you like. Film is governed by the cut, so scenes are much shorter generally, as you move from moment to moment, place to place. There’s an economy of words. Film is also much more the director’s medium. Theater is the writer’s domain. They can both be very rewarding creatively but in film as a writer you tend to step back and let the director do his or her thing. Show up at the screening and say, Oh, they cut that line or they cut that scene, okay. In theater the writer is usually much more involved day to day and that allows for more creative input and control. I tend to work on stories based on real-life people or events, so for me the key is in the research and then deciding the best way to tell the story. Whether it’s stage or screen, I tend toward character-driven pieces. Connecting myself and then the audience to these characters is my first priority. I’ve just always had a curiosity about people, what makes them tick, why they do what they do. I can remember being in 6th grade and we had an anthology of short stories to read and before each story there was a brief passage of description about the writers of each story. A biography about them. This fascinated me. I found the people behind the story just as, if not more, interesting than the stories themselves. How and where they were raised, where they went to school, what influenced them. For me, the people behind the story WERE the story! Tiziano Thomas Dossena: Charles, your experience with directing, both plays and musicals, is quite ample. Do you find directing your works any easier than directing other authors’ work? Are you able to write even in the period in which you direct? It’s obvious that directing is a major activity for you; any new play or musical in the works that you want to talk about? Charles Messina: I have directed a lot of my own work. I think singular vision is very important. A writer can get inside their own work in a way that another director may not be able to. Especially if a piece is autobiographical. There’s a shorthand that a writer can bring to their own work that I think can make the piece very specific and unique. Of course I’ve directed other people’s work and have had some wonderful directors take on my writing. It’s all about understanding and trust. I am working on a show now called The Storm. It’s a musical based on the true story of composer Jeremy Long’s grandparents who were these marvelous show business personalities, who lived an incredibly successful and sometimes turbulent life. Jeremy asked me to come onto the project because he knows I understand the value or personal storytelling. I’m co-producing the project and may end up contributing as a writer or director, we haven’t decided that yet. But the key is being connected to the material and to your co-creators so that the creative process can be open. Trust and openness is the key to any collaboration. 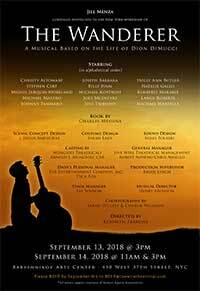 Tiziano Thomas Dossena: Your musical “The Wanderer” about the life and music of Dion is having a great success after its recent workshop in NYC. Can we expect to see s full production of it any time soon? Is it Broadway bound? Can you tell us something about it? What prompted you to write this musical and direct it? Charles Messina: The Wanderer is truly a great show. I’m very proud of it. We recently had our workshop presentations at The Baryshnikov Theater in NYC and the response was overwhelming. We have such a wonderful catalog of music in it. All Dion’s hits, from Teenager in Love to Runaround Sue to Abraham Martin & John. And of course the title track. It’s just great music. In addition, we tell the compelling story of Dion’s life, including his struggles with heroin addiction and how his life was saved by a renewed faith in God. It’s very powerful. It’s going to surprise a lot of people. We’ll be taking it on the road next year and then, God willing, to Broadway soon after that. I was excited to work on the book for this show. It was a great fit for me as a NY kid who knew Dion’s music. We were introduced through a mutual friend and we really hit it off. I think there was a fast connection, two NYC guys, Italian American. We knew each other’s culture and upbringing because it was the same. He was from the Bronx, I was from Greenwich Village. But we shared that Italian thing that you have to be inside of to fully comprehend. I immediately saw his life as a Broadway musical. But we both wanted it to be real and authentic. Not fluffy or glossy. We want edgy, dark, honest. This is about addiction. But with all that great music throughout. I think it’s a very special show and I can’t wait until the world sees it. People ask if it’s a jukebox musical and we say, no, it’s REAL LIFE musical. Tiziano Thomas Dossena Freddy Mercury was the icon star for a few generations, even after his death. You wrote “Mercury: The Afterlife and Times of a Rock God.” Is that a play? 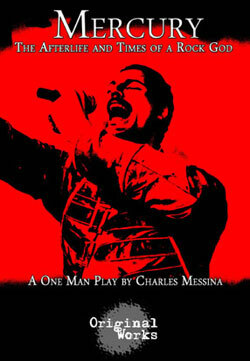 Charles Messina: Mercury was a monodrama I wrote about Freddie’s life. I’m very proud of what we were able to accomplish with that piece. To just strip away the rock star glam and glitter and show the man. That was most important to me. He hid so much of his true self from the world for fear of exposure – his sexuality, his ethnicity. And this was long before the upcoming biopic that they’re releasing. We were light years ahead of the curve on that one. Tiziano Thomas Dossena: Although you are known for your deconstructive take on biographical subjects, I found only one book written under these premises. Is this going to be the exception or do you project to write more books like this one? What made you decide to co-write “My Father, My Don” with Tony Napoli? I previously reviewed the book, which I found very well written and emotionally captivating, and at that time I had extended my compliments to you for your ability to retain Tony’s informal, almost intimate language. How difficult was it to abstain from rewriting the story with your voice? Did you enjoy working with Tony? Is the filming of the movie based on the book still going on? Are you involved with it? Charles Messina: Writing a book is a marathon, not a sprint. It takes time. Research. It’s an arduous process. I found working on My Father, My Don an to be a learning experience. To tell a story from the first person point of view and capture the rhythm and tonality of another person’s voice, and to keep it genuine and truthful, that was a wonderful challenge. As a playwright, I’m used to writing dialogue, so staying committed to the first person narrative was comfortable for me. Sustaining it over 300 pages, that was the harder part. My Father, My Don should make a fine film. I’m not currently involved with any adaptation of it. I have been asked about writing other books. I think there’s a little Mob fatigue out there. So Mob subjects don’t particularly interest me at this point. Maybe if it were the right one. I have some ideas. I will write another book one day. The timing just has to be right for it. Tiziano Thomas Dossena: How much did your being Italian American influence your life choices and your behavior in general? Charles Messina: Anyone who knows me knows just how much being a NY Italian American means to me. That is my world. Those are my people. I was raised in it. It’s in my blood. It was and will always be a part of me. I know their ways, their food, their hopes and dreams, their phrases! To me when I talk about what’s real, I’m talking to a great extent about Italian Americans and their culture. Their manners and rhythms and the particulars of their language, that’s what real sounds like to me. That’s what real is. Brash, funny, but always to the point, always alive, connected and energetic, that’s what influences my writing. That’s what my ear picks up. That sound is the sound of someone telling it like it is. I have often said that ethnic authenticity is the most important thing to my work. It’s hard to teach what being a real Italian American looks and feels like. You know it when you see it. It comes out of the pores. It’s in the DNA of my being and of my work. Tiziano Thomas Dossena: If you had the opportunity to meet and talk with a person from the past, anyone you wished, who would it be and what would your conversation with them be about? Charles Messina: My mother. She passed away in 2009. She saw some of my work but not all of it, of course. Although a part of her is in all of it. The lead in A Room of My Own is based on her. She will always be my greatest influence. I owe everything that I am to her. I owe my active language as a writer to her. My sense of humor is hers. She had no filter. She said it just as she saw it. Funniest, toughest, boldest person I have ever known. When I’m stuck for a line as I’m writing I will often ask, What would my mother say here? She had the funniest and most particular turns of phrase! She could do with one sentence and a look what it takes writers whole novels to convey. She was hyper-aware and sharp. Sometimes biting and cruel. But a true original. Her mind was ten steps ahead of everybody else. Fiercely supportive of me. Funny thing is, she was stricken with throat cancer and lived the last 14 years of her life without her voice. Yet, she was more articulate and more expressive than ever! She really gave me the confidence to believe that I could do anything, that I had as much right to be what I wanted to be as anybody else did. She was defiant about that. She worked the counter in a bakery and my father was a truck driver, a teamster. Worked their asses off. Put me through Catholic schools and then college. When I said I wanted to go to NYU to become a writer and a director, they didn’t flinch. They said, “Become whatever you want to become.” So if I could meet one person, it would definitely be my mother. What would I tell her? I think I would show her something. I’d roll up my left sleeve and show her the MOM tattoo I have on my forearm. She never saw it. I had it done after she passed away. It’s designed with steel beams to symbolize her strength and when I put my arm down she’s always there, by my side. I could see her being proud of it, smiling and saying, “My son-my son, you did that for me.” And I’d say, are you kiddin’, Ma, after all you gave to me, it’s the least I could do.